With limited time to write anything longer, a couple of quick things to note about yesterday’s Brazilian Grand Prix. Ah, Monday morning and so little time to say anything. 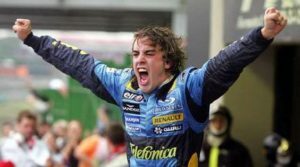 Nevertheless, Fernando Alonso’s Formula One Championship title (he’s the youngest ever Formula One champion) can’t go without note [Alonso clinches Formula One title] nor can Christian Klien’s superb qualifying performance [itv.com/f1 – Klien goes from zero to hero]. I preferred the later UK start time for the Grand Prix. 6pm seems like a much more sensible hour. In news … Minardi sold to Red Bull Racing. On Friday, I mentioned that The Guardian was getting its new look tomorrow. You can follow the paper’s editors as they plan prepare tomorrow’s paper at The Editors’ Weblog that has launched on the site. In tomorrow’s sport section I hope they cover Formula One in some detail. It’s been announced that Red Bull Racing will take over the Minardi team from November. Minardi’s boss, Paul Stoddart, told BBC News “Small privateer teams are probably phasing themselves out … it’s hard to imagine a truly privateer team can break into F1 again”. I think that’s sad for the sport really but the who really has got that much money? Times, they are a changin’. Actually, Guardian. It’s a changin’. My favourite newspaper is changing. No, I don’t know what Berliner means either but that’s not a problem. No longer will I be hitting old ladies with a newspaper, or getting tangled in a iPod hub’s cable or stopping a City gent scrolling his Blackberry. Smaller, neater, lovely. Danm, it looks hot and it’s only a newspaper!